FYI: This post contains an insanely delicious chicken pot pie recipe that your family will demand you make over and over (and over) again. It is the ultimate comfort food. I’ve had a fierce craving for chicken pot pie. Earlier this fall, my husband and I sneaked away to enjoy a weekend in Bayfield. We enjoyed a quiet lunch at a funky, slow-food deli called The Fat Radish while we were there. The chicken pot pie recipe they used was the best I’d ever had; with each bite, I’d ramble on about the flavor, the texture, the consistency. So flippin’ good. That night, I dreamed of chicken pot pie. We went back to The Fat Radish the next day, so I could indulge again, but alas… the quaint deli had a constantly rotating menu. There I stood heartbroken and S-O-L. Since then, I’ve been on a mission to find the perfect chicken pot pie recipe. I’ve been ordering it at restaurants and experimenting at home, but nothing seemed quite right… until now. A quick heads-up… Making homemade chicken pot pie is a time-consuming endeavor. If you need to cut corners because your family has a busy schedule like mine, I suggest you use a pre-cooked rotisserie chicken and pre-made pie crust. What you do not want to skip is the fresh veggies and the handmade roux. So many of the simple chicken pot pie recipes I tried called for cream of chicken soup. Let’s be honest, this is the downfall of an “easy” chicken pot pie recipe. Gravy and roux have always freaked me out, but if you follow the instructions below, you can make an insanely delicious chicken pot pie *without* cream of chicken soup. Trust me, you’ve got this. Delicious homemade chicken pot pies to warm your heart. Place potatoes and carrots in a large saucepan; add water to cover. Add a dash of salt and bring water to a boil. Reduce heat; cook covered, 8-10 minutes or until veggies are tender. Drain. In a large skillet, heat 1 tablespoon of butter over medium-high heat. Add onion and celery; cook until tender. Add remaining 3 tablespoons of butter and melt. Stir in flour and seasonings until blended. Gradually stir in broth. Bring to a boil, stirring constantly. Cook and stir for 2 minutes or until thickened. Stir in chicken, peas, carrots and potatoes into the mixture. Remove from heat. Evenly distribute chicken mixture into greased ramekins (makes 5 mini pies), a 2-quart pie pan, or an 8x8 dish. Unroll pie pastry sheet and place over filling. Pinch edges, seal, and cut slits in tops. Brush pastry tops with milk. Bake at 375 for 25-30 minutes or until crust is lightly browned. Let stand for 10-15 minutes before cutting or eating. ENJOY! 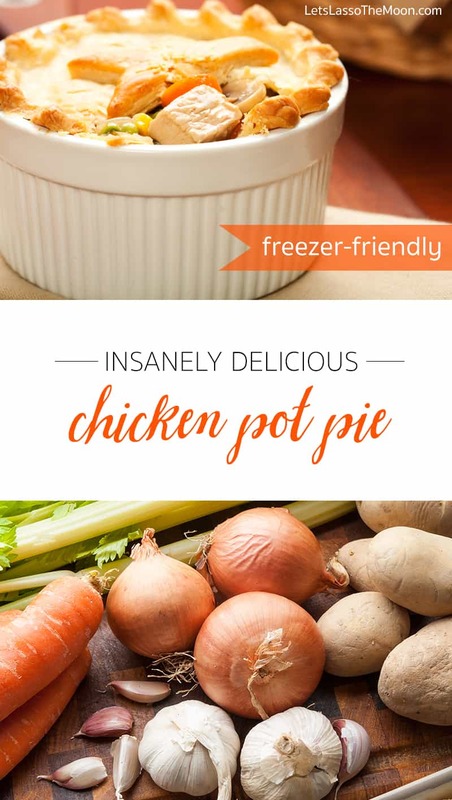 If you make the full-sized pot pie, this is a great freezer recipe. After you've prepped the recipe, cover and freeze unbaked pies. To use, remove from the freezer 30 minutes before making (do not fully thaw). Preheat oven to 375 degrees. Place pies on baking sheet; cover edges loosely with foil. Bake for 30 minutes. Insert thermometer in center and continue to bake until center reads 165 degrees. We make this chicken pot pie recipe in ramekins. Everything tastes better when “mini,” right? We all love the fun, curvy edges, and with mini chicken pot pies, each member of my family gets more of the most delicious part: The outer crust! 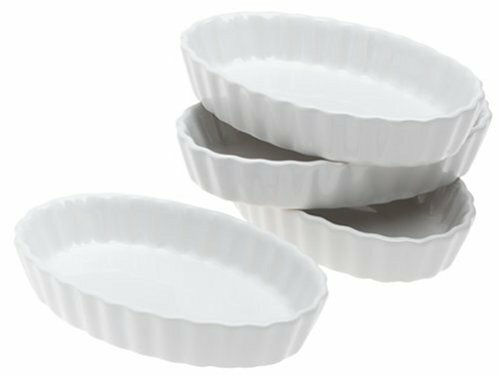 We love these shallow ramekins. They offer the perfect chicken-to-crust ratio! Don’t have ramekins? Consider getting some for your kitchen. They are oven safe and great for doing impromptu things like making mashed potato pies from last night’s leftovers (topped with cheese, of course). Last of all, ramekins are the perfect-sized snack tray for kids. We use them to serve up fresh veggies, berries, and such. The girls and I have been watching The British Baking Show and The Worst Cooks in America on Netflix together. We’ve learned so many random cooking and baking facts from these shows. It’s also opened to the door to the kids trying new foods and being more engaged in prepping dinner. My daughter and I popped on Pandora and chatted while peeling and chopping the veggies. It’s these small moments that open the door to big conversations. Don’t miss them. Be sure to get your kids in the kitchen. There are only three things in this world that will make me cry: the movie “A Little Princess,” when I break my phone, and onions. The Little Princess is one of my favorite movies. I can’t watch it without breaking into tears at the end of this version of the movie, no matter how many times I’ve watched it. Did you know?!?!? You cry when an onion is cut because enzymes create battery acid in your eyeballs? Take a moment to watch this short video with your kids. Fascinating. Part way through, Rose needed to abandon cutting the onion because she was crying too much. 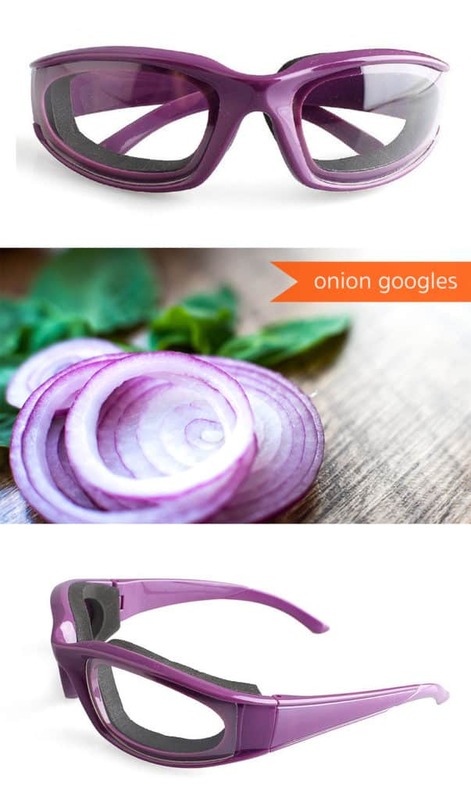 Perhaps our family needs to invest in a pair of onion goggles. Ha. Seriously, they exist! I hope you enjoy this chicken pot pie recipe as much as our family did. If you have any questions about the recipe above, let me know on Facebook or in the comments below. P.S. This recipe was so freakin’ good, the family ate it all before I even had a chance to get an Instagram pic. I promise to share photos from our kitchen the next time we make this! Awesome ..I’m going to try it! Question..perhaps I read through too quickly but do you have crust enfolding the whole pie (bottom and sides) or just top? I’m totally into pot pies now too and have had some of these single serving sizes all intact within a crust! Thank you!! Try letting your tongue hang out while chopping an onion. Yes it looks rediculous, but the fumes hit the tongue before your eyes. Truly the perfect pot pie.